As the future of my ministry firmed up this last week, it clicked through a series of permissions that I'd set for myself more than a year ago. I'm funny that way, in that desire for transitions to connect events in my life to one another. 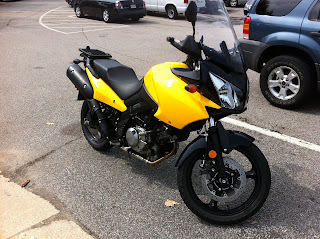 When I got my last motorcycle, for instance, I'd tied bike ownership to getting ordained as a pastor. Once the Good Lord's providence prevailed, and it happened...boom...there was my black YZF600R. It was a sweet ride. Has been for six years. Still is, although it's getting a bit long in the tooth. As, frankly, am I. The sporting semi-crouch that was a tolerable riding position back when I was 35 was starting to cause pain after anything more than half-an-hour in the saddle. Blemish has piled upon scratch, and though it still runs strong, the 41,000 miles on the odometer have been hard won trolling on the Beltway. It was time for a new bike. Or, rather, a new used bike. I knew exactly what I wanted. Something right-sized, meaning no giant honking 150 horsepower egocycle. Something sane. Something with ergonomics that reflect the actual character of the human body, and a design that reflects the way I ride. I knew what I wanted. 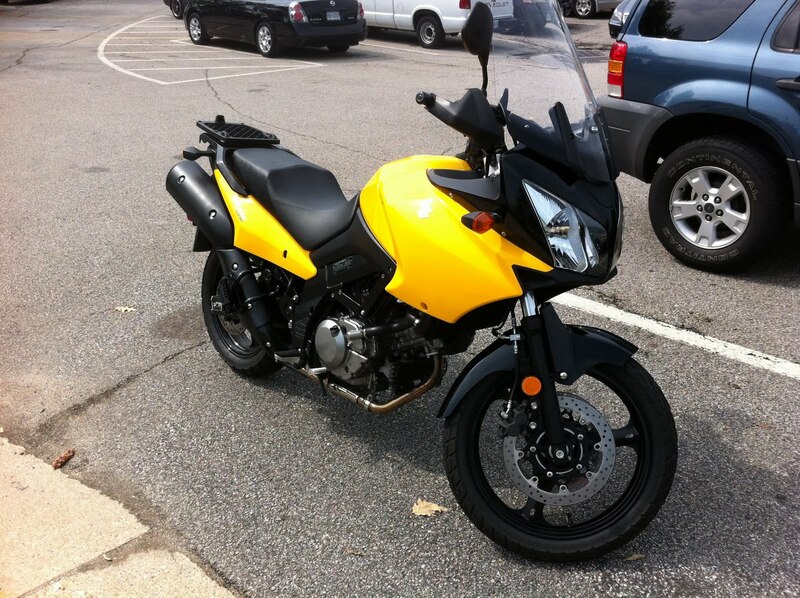 Just the right Suzuki VStrom 650 popped up onto Craigslist a couple of weeks ago. It's an adventure-tourer, or so they call tall standard bikes these days. Light, balanced, but also capable of taking you transcontinental without batting an eye. It's comfortable on the superslab, and can acquit itself well on fire-roads and hard-packed dirt, too. The bike's hornet yellow, which doesn't present quite as moody and truculent a vibe as motorcyclists generally want to give off. But then again, if it's good enough for the G-Class star around which we orbit, I suppose it's good enough for me. So on Saturday morning, me and the missus hopped into our eco-pod and went south on 95. We arrived at a giant anonymous strip mall, where the seller had agreed to meet us. He arrived on the bike, his twenty-something daughter and large laconic son riding support in a big Toyota pickup. From moment one of our exchange, I knew he was a good egg. He had the buttery genial warmth of a Southern gentleman, and his care for the bike and his concern that I know every last detail about it was the sign of a good seller. The bike itself gleamed like it was just out of the showroom, only modded out exactly the way I would have done it myself. As I examined it, we shared a bit of our lives. He was a preacher's kid, as it happened. The son and daughter were two of his ten kids, all adopted. Though he was in his late fifties, he and his wife had just adopted two more, brother and sister, eight and five. Time for riding suddenly wasn't there like he'd thought it might be. And though he'd ridden his whole life, arthritis was claiming his legs, and it just hurt too much to be fun. He radiated good karma and kindness. When it came time to haggle, I did so reluctantly, and ended up going a hundred bucks over budget. The bike was perfect, better than new, and I wasn't about to lie and claim it wasn't. The price was fair, and I won't bargain a good man down from a fair price. Or a bad man, frankly, but they're harder to get down to a fair price in the first place. When I rolled back from the bank with the cashier's check in hand, we got to the signing over of the title. He signed it over, but paused at the line that denoted the purchase price. He asked if I wanted him to leave it blank. You know. So I could fill in the price myself. Maybe save a few bucks in taxes. I thanked him for the offer, but demurred, being a pastor and all. It wasn't just that I'd rather not misrepresent a sale price, though that was certainly the case. I honestly don't mind paying that $153 extra that went into the coffers of the great state of Virginia. It'll pay to patch the pothole that might throw a noob rider off his bike. It'll pay for the state trooper standing there writing me a ticket, too, but that same trooper would protect me from assault and watch out for my kids and call in a chopper to rescue my family in a flood, so it's a net gain. Rendering unto Caesar just doesn't bother me, if the price is fair for what you get in return.